Phil Knight is best known for being the co-founder and former CEO of Nike, multinational corporation that is engaged in the design, development, manufacturing and worldwide marketing and sales of footwear, apparel, equipment, accessories and services. Phil is a philanthropist giving away millions each year to support health care, higher education, and other causes, primarily in his home state of Oregon. He also the author of Shoe Dog: A Memoir by the Creator of Nike. 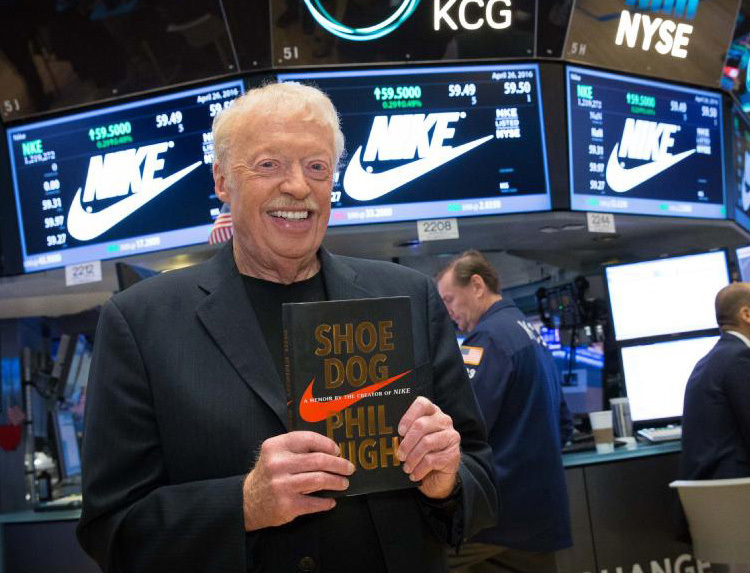 In Shoe Dog: A Memoir by the Creator of Nike, Phil Knight takes the reader on a front seat ride through his journey from borrowing $50 from his father to start a shoe company to creating one of the most profitable retail brands in the world. As many others have said before, including Warren Buffet in his 2016 Berkshire Hathaway shareholder letter, "Phil is a very wise, intelligent and competitive fellow who is also a gifted storyteller." In a time where Adidas and Puma dominated the shoe market, Phil Knight and his business partner and coach Bill Bowerman overcame tremendous odds to create a company to compete on the same level. Phil takes us through with tremendous detail his business negotiations with not only the Japanese manufacturers, but his bankers, employees, how he met his wife, and even chalks up a couple life lessons he's learned along the way. He reveals his secrets of how he become a successful entrepreneur. In the early days while working on Blue Ribbon, Phil juggled working firstly with Price Waterhouse, and then Coopers & Lybrand. Then became an accounting professor at Portland State University (PSU). The reason he did so was so that he could stay on his feet or in effect somewhat hedge his bet against his business, while growing his business at the same time. But, he quickly quit both to focus on shoes. As someone who has been more curious about how businesses thrive and build competitive advantages, Phil offers enormous insight using Nike as somewhat of a case study. He had a great business partner in Bill Bowerman who was constantly inventing and improving shoes for his Olympic athletes. In addition, his extreme passion for sports and shoes helped him get through the ups and downs. By combining constant innovation from feedback from athletes on the highest levels, athletic endorsements, and shrewd manufacturing tactics, Nike became what it is now today. While Shoe Dog is largely a book about Phil Knight and Blue Ribbon becoming Nike, towards the end of the book Phil parts with some encouraging life lessons over his seventy plus years. For those that are less business oriented, these alone are noteworthy tidbits. He like many other successful individuals highly recommend that men and women in their mid-twenties not settle for a job or a career. Instead, find a calling. The fatigue and disappointments in life will be easier managed and your highs will be much more gratifying. Overall, this is an entertaining and contains a lot of useful business lessons.